Almost a year gone, and we are finally able to see some update about “Android Auto“. Now for the first time we have a production car to support this, the 2015 Hyundai Sonata. We just have to wait and see whether Android Auto will beat the default navigational smart system in their vehicles. Hyundai’s 2015 model Sonata will be the first production car to support Android Auto. It will be integrated along with Sonata’s existing in-car navigational system. They will offer Google Maps navigation, Google Voice Search, Messaging Facility, Listening to Music/Podcasts, etc. Android Auto needs to be paired with an Android smartphone supporting Lollipop (or newer) to be connected. Drivers don’t just use the navigational system in their cars, they also use this for communicating, listening to music, or even reading their Facebook updates / Twitter tweets. Sounds scary, but these can be avoided whenever we want. The Android Auto UI won’t be the same as your smartphone but it’ll have all the necessary options for car and other required uses. Hyundai’s 2015 Sonata is the first model to get this, though they assured us that other models will get Android Auto support within this year. If you are curious about whether they’ll have collaboration with Apple’s CarPlay as well, then yes, they have plans for integrating this too. 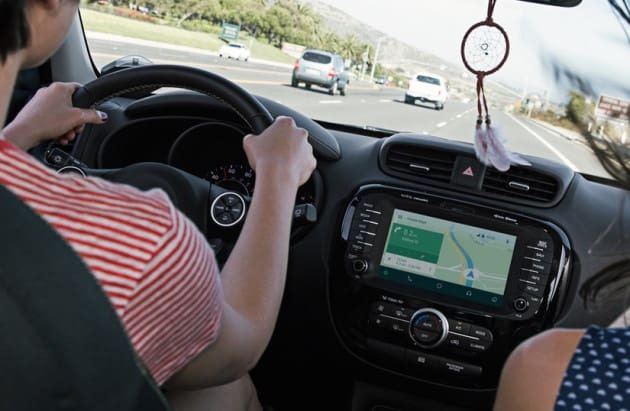 It is to be noted that Google has already partnered with nearly 30 automotive manufacturers for supporting Android Auto.